The Republican chairman of the House Committee on Homeland Security is demanding the United States respond forcefully to Russia's involvement in the presidential election hacks. Rep. Michael McCaul (R., Texas), a member of President-elect Donald Trump's national security team, told an audience on Wednesday that Moscow should face "consequences" for directing cyber attacks on American systems in an effort to interfere with the 2016 presidential election. "Russia's recent hacks and attacks should be a wake-up call and a call to action. There needs to be consequences to these actions," McCaul said at the conservative Heritage Foundation in Washington, D.C. "On the international stage, if we don't respond and show them that there are consequences, the bad behavior will continue." The U.S. intelligence community publicly accused the Russian government of directing cyber attacks on systems used by American citizens and political organizations in October, resulting in an erosion of already frayed relations between Moscow and Washington. While the Obama administration said it planned to deliver a "proportional" response to Russia, McCaul said he had seen no sign of such retaliation. The lawmaker delivered a broad assessment of the national security challenges facing the United States in his remarks and called on the incoming administration to implement a better cyber strategy. "We can't allow foreign governments to interfere in our democracy, and when they do so we must call them out on it and respond forcefully, publicly, and decisively," McCaul said. "The United States should respond to cyber attacks in a way that will make our adversaries think twice before they do it again." 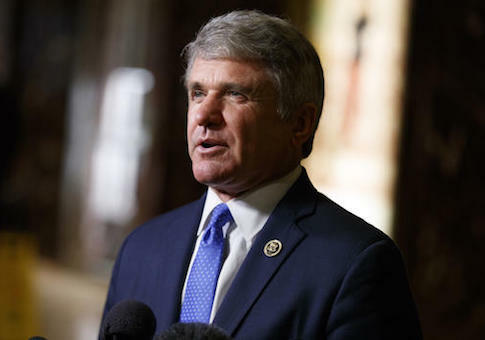 McCaul delivered a firm rebuke of the Obama administrations counterterror, immigration, and cyber security policies, saying that the United States has become less secure under the current president. The issue of cyber security has prompted greater attention in recent years as hackers from Russia and China have infiltrated systems used by private American companies as well as government and military officials. Chinese hackers, for example, stole the personal data of more than 20 million Americans in a major attack on Office of Personnel Management computer networks between 2014 and 2015. McCaul, who said his own security clearance was stolen in the OPM hack, said Obama insufficiently responded to the hack by holding a meeting with Chinese officials. Shortly after the attack was revealed last year, Obama hosted Chinese President Xi Jinping to a state dinner and the two agreed to cooperate on curbing cyber attacks. "And the bad behavior continues," McCaul said. McCaul outlined a number of priorities for his committee as it works with the new administration to confront the threat of radical extremists, bolster border security, and tackle cyber threats. The congressman noted that the GOP national security agenda unveiled earlier this year calls for the United States to begin "treating network security as a matter of national security." He also discussed the need for a reorganization of the government's anti-cyber efforts at the Department of Homeland Security. "I proposed a major reorganization and consolidation of our domestic cyber efforts into a single, strong cybersecurity agency at the Department of Homeland Security. This will be one of my highest priorities in 2017," McCaul said. "In addition, we will do more to help state, local, and private sector stakeholders protect their own networks and share cyber threat data." McCaul said his committee would soon unveil "serious reforms" to be implemented at DHS's intelligence enterprise and that he and other members will work with the Trump administration to reform the department. McCaul was rumored to be a potential pick for Trump's DHS secretary, but reports emerged Wednesday morning that the president-elect had chosen Gen. John Kelly, former commander of U.S. Southern Command, to lead the department. This entry was posted in National Security and tagged Cyber Security, MIchael McCaul. Bookmark the permalink.